Poor grading around a house, a depression in a yard or just plain poor drainage can lead to standing water, wet basements and myriad of problems associated with them. A French drain will move water away from your house, help you keep your home dry and solve your problems with standing water. Soil that holds a lot of water can let that water seep into basements, around foundations and into crawlspaces. 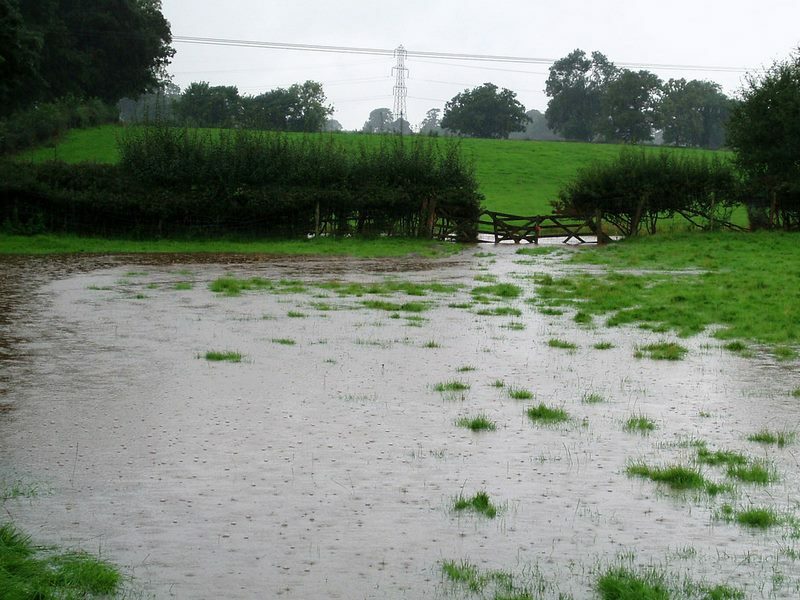 They water can also accumulate on the surface into ponds and standing, stagnant water. One solution is a ditch to drain standing water away. A ditch works, but its ugly, possibly dangerous and eventually it will fill in with silt and have to be dug out again. A better solution is a French drain installation. 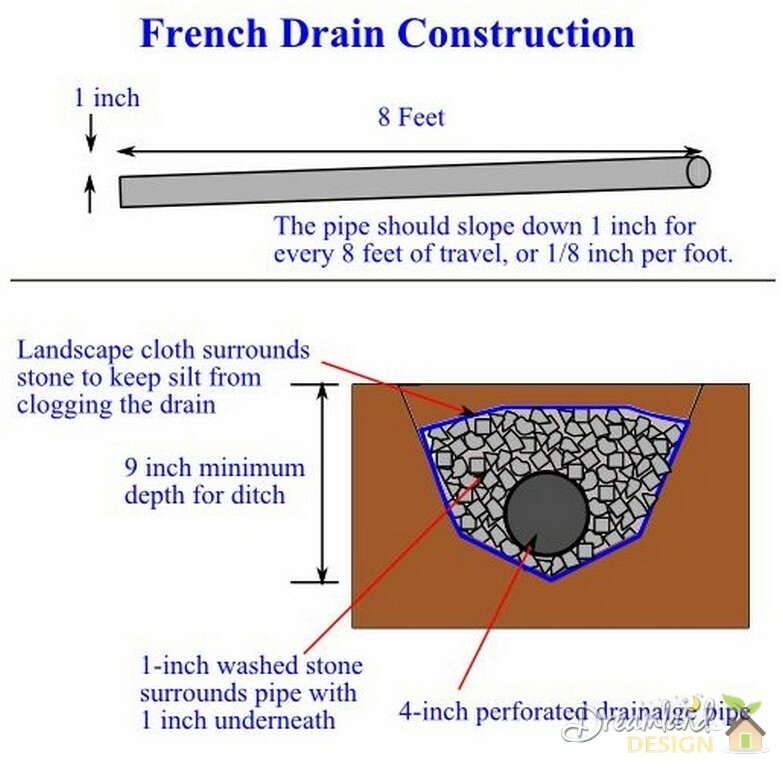 A French drain is mainly a piece of pipe with holes along the bottom, laid in a ditch lined with landscaping cloth and filled in with stone. The pipe may also be wrapped in cloth as an extra measure of protection to keep the dirt out of the pipe, but allow water to pass enter it. The cloth acts as a filter, the ditch filled with stone behaves as a storage basin and the pipe drains the water away that enters the basin. Pressure in water-saturated soil forces the water out of the soil and into the French drain. Remember that you are responsible for the water that leaves your property. Don’t direct water into the neighbors yard or adjoining property unless you have permission. Some communities prohibit French drains and that is a consideration as well. However, communities also have an obligation to allow you to protect your property and most will work with you to alleviate water problems. Two possible uses for French drains include draining water from gutters and sump pumps away from your home and moving run-off water from area to another. Ideally, all French drains lead downhill. You’ll need a shovel, a straight, 8-foot long 2-by-4, 4-foot level, 4-foot wide landscaping cloth (the kind that lets water through), and perforated drainage pipe and washed stone for fill. Washed stone doesn’t have sand in it, it’s just stones. Dig a ditch where you want to lay the drain. The ditch should be about 12-inches wide at the top, a minimum of 9 inches deep and as long as you need it to be. Try to shape the bottom of the ditch in a U-shape. As you dig, remember the drainage pipe must be pitched down 1/8-inch for every foot it travels. Lay the 2-by-4 on the bottom of the ditch and set the level on top of it to check the pitch. You should have to lift the end of the level 1 inch off the board for a 1/8-inch per foot pitch. Lay the landscaping cloth in the bottom of the ditch with the edges up on either side. Place about an inch of stone in the bottom of the ditch, then place the pipe on top of the stone with the holes down. Continually measure the pitch to ensure you don’t have high spots on the pipe. As work along the ditch, fill it in with more stone but leave the top 2 or 3 inches of the ditch empty. Fold the landscaping cloth over the stone and fill in the top with more stone or with dirt. If your soil is comprised of fine silts or clays, it is worthwhile to take the time to wrap the pipe with its own layer of landscaping cloth to keep silt from clogging the drain. When the pipe exits the soil downslope from where it starts, finish your French Tile drain installation by covering the pipe with landscape cloth to keep animals, leaves and other debris out of the pipe.